There’s a lot we’ll never forget about 2016, and 2017 promises to be just as memorable. So why not celebrate New Year’s Eve in style with Skyline Cruises? If you haven’t yet made plans for the biggest party night of the outgoing and incoming year, you’d better act fast! Our annual New Year’s Eve Gala Dinner Cruise is always one of our most popular events, and we’d like to tell you why you should celebrate with us. Skyline Cruises are always memorable as you get to cruise from Flushing Bay to the East River, passing several of the world’s most iconic sites on a night when millions of people from around the globe will pack into Manhattan and the surrounding boroughs of New York City to welcome in 2017. You’ll pass by historic locations such as Gracie Mansion, the official residence of New York City’s mayor. The Manhattan skyline will be lit up for the big night and you’ll have fantastic views of the Empire State Building, the United Nations, and the Freedom Tower. The Skyline Princess will travel under the city’s five East River bridges and you’ll enjoy an incredible close-up look at the Statue of Liberty. You won’t have to worry about the cold weather as you’ll sail on our climate controlled luxury yacht, the Skyline Princess. Our guests will have plenty of room to see all of the spectacular views as the ship has more than 6,000 square feet of space. If you do want to get some fresh air, we have three outdoor viewing areas. But there’s certainly enough to do inside and you’ll still be able to see everything on our fully enclosed and heated decks. Or you can simply party and dance the night away into the New Year on our spacious dance floor. 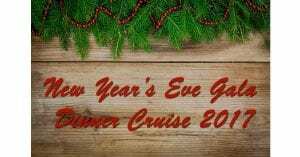 You’ll find plenty of extras on our New Year’s Eve Gala Dinner Cruise. Your five-hour trip will include a premium open bar featuring top brands like Johnnie Walker Black Scotch or Grey Goose Vodka. We’ll give you a gourmet dinner buffet cooked in our galley (kitchen) and our experienced wait staff is available to assist you. Your dinner, prepared by Chef Rob will include a selection of gourmet cakes and pastries for dessert. We’ll give you party favors, including traditional trinkets like noisemakers, party hats, glasses, and necklaces and we’ll provide you with a champagne toast in time for the midnight countdown. We’ll also have a DJ playing dance music throughout the night. The New Year’s Eve Dinner Gala Cruise leaves from the World’s Fair Marina in Flushing Queens, New York, where free parking is available. Boarding time is 8:30 p.m. and your cruise is scheduled to run from 9 p.m. to 2 a.m. We offer cabaret seating at large tables and all guests will have a seat. Private tables are available at an additional cost. The cruise will sail rain or shine and proper attire is requested. We can’t think of a better way to start 2017, but you’d better book now because reservations are going fast. Contact Skyline Cruises today!